A short game skill every golfer should have is to hit two distinct shots with the same wedge — one shot in which the ball runs after it lands, and another in which the ball stops quickly. The reason this is important to know is that the wedge you choose will be primarily determined by the distance to the pin. But, in one instance you might have clear ground all the way, in which case landing short and running the ball to the pin is the best choice. In another instance, you might have to hit over something and not have a lot of green to work with. Now you have to throw the ball over the trouble and have it land there and stay there. 1. The Running Shot. 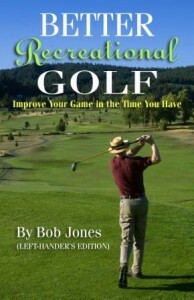 This is a shot from my book, Better Recreational Golf, called the Air Chip. Play the ball in the middle of your stance with the clubface square to the target. Take the club back and let your wrists hinge naturally. On the downswing, let the wrists unhinge, but when they get to the ball arrest that movement and follow through with firm, but not rigid wrists. In the follow-through, keep the clubhead as low to the ground as possible, and keep the clubface pointing at the target. The ball will take off lower than normal, check a little, then run to the hole. Experiment with your wedges to see what the air-to-ground ratio is for each one. 2. The Checking Shot. Align your stance about five degrees to the left of the pin. Open the clubface so it points to the pin. Put the ball in the middle of your stance. Swing back and through, letting the club arc upwards on each side of the ball. Swing along your body line, not at the target. The key to this shot is club speed. The prime rule of the short game is speed = spin. Hit through the ball faster to get more spin on the ball. This, of course, is what will make the ball stop when it lands. I said faster, not harder. There’s a difference. Since the clubface is open, the ball will go higher and thus shorter. You have to take a longer backswing than you think you need to so the ball will carry the trouble. Practice this part well, because it will seem at first like the right swing will send the ball way past the pin. Balance is the unsung fundamental of the golf swing. Only when you are in balance can you hope to deliver the clubhead to the ball at high speeds consistently. One of the best ways to have good balance during the golf swing is to focus on a balanced follow-through. I’ll assume you are balanced at address. That might be a large assumption, but I’m willing to make it. It’s how your swing ends up that is the best indicator. If you lose your balance somewhere in the swing, you’ll not get it back in time to be balanced at the end, nor when you’re actually hitting the ball. The way you get out of balance most often is likely to be that you swing too hard. That throws you off balance in nothing flat. Let me tell you about the day I had to go the opposite extreme. 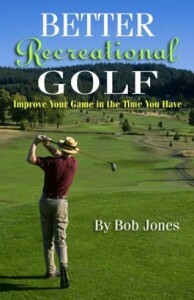 When I got to the golf course one morning, I got by clubs out of the car, but couldn’t find my golf shoes. I had left them at home. All I had on my feet were a pair of moccasins. It had rained the day before. The ground was wet, and because it was early, the grass was covered with dew. By the third hole my socks were soaked, and by the fifth hole my moccasins were soaked. Slippery city. The only way I could swing a club and not fall down was to swing nice and easy, very much within myself. This was an executive course, par 3s only, from 110 yards to 190 yards. Without the ability to yank the ball, my easy swing led me to a calm, balanced finish so I could watch beautiful ball flight. I have seldom had a better ball-striking day from start to finish. We all think about hitting the ball hard so we can get distance. What’s more important is hitting the ball straight and doing that consistently. When you take your practice swing, concentrate on a balanced finish. When you make your swing at the ball, strive to get to that same balanced finish. Odds are your shots will be much better. When you need a free par, the par-5 holes are just what you’re looking for. Think of them as extra-long par-4 holes on which you’re playing for bogey, and you’ll be just fine. The typical length for a par-5 hole is 485 yards from the white tees, and 415 yards from red tees. This really isn’t very far if you have three shots to cover that distance. The key to getting those pars is keeping the ball in the fairway. From the white tees, leave your driver in the bag. Hit 200 yards or so off the tee with a hybrid iron or fairway wood. Your second shot with the same club will leave you within 100 yards of the green. From there, it’s a pitch-and-putt par-3 hole. Couldn’t be simpler. The same strategy will work for shorter hitters playing from the red tees: fairway wood off the tee, fairway wood off the fairway, pitch to the green, putt, putt = par. Just because the hole is long is no excuse for hitting a driver off the tee, unless you hit your driver very well. You get four chances every round to get an easy par. Don’t blow the opportunity. What I’m saying is that you should practice shots, not phases. Then I got to thinking, how would you allocate your time between these shots? You would certainly want to spend more time on the ones that are most important. But which ones are the most important? I listed six shot types (swing, long pitch, short pitch, chip, sand, putt) and compared each one head to head. That’s fifteen comparisons. In the spreadsheet below, I wrote in the cell the most important shot, in my opinion, between the one in the column head and row head (click to enlarge). You can see that “swing” came out on top all five times. You have to jump around a bit, but chip came out on top three times. The list below the table shows how many times each shot type won a comparison. Because “sand” is 0 does not mean it has no importance, but that it is the least important shot of the six. 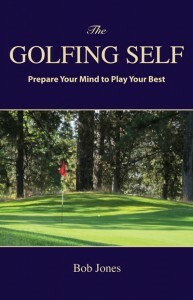 This list tells me how I should prioritize my practice: swing first, putting second, and so on. It does not tell me how much time I should spend on each shot type. I would suggest working on all of them at least a bit, and spend extra time on the one(s) you are having trouble with at the moment. This is my take based on how I play right now. Ten years ago, when my swing was less accurate, I was hitting more short pitches into greens than chips, so those shots would have been in different order. As far as sand goes, I’m hardly ever in a bunker. You might want to make up your own shots type and run your own comparisons. It would show you how to spend your practice time wisely. It is a fact that when the rhythm of your swing is right, it is a lot easier to hit the ball consistently well. You can count it out, and I have written often on that method. There is another method, which is perhaps easier in that it follows an energy that is universally available and is always the same — gravity. My previous post alluded to this in helping you make your swing feel like it is one continuous motion, not two motions connected somehow. In this post, I want to go into more detail on the gravity-assisted swing to show you how it creates proper rhythm. We’ll do that by refining the transition. The backswing should be thought of as making the clubhead float upwards, not of lifting it upwards. This style of taking the club back ensures that the golfer stays relaxed. Tension is the enemy of sound movement. When the backswing has reached the limit that the golfer has selected for it, the backswing movement comes to a gentle, but definite halt. Though your body has stopped moving, your mind might feel like there is still movement in that direction. The club will still feel like it is floating, and for split-second, it is. At the apex of its flight, when it is moving neither up nor down, it feels weightless in your hands. The handle places no pressure on the palms of your hands at any spot. Now comes the key to achieving natural rhythm. As the club comes down, the hands must come down with it in such a way that the neutral feeling inside them remains unchanged. If you move down too early, it will feel like you are pushing down on the handle. If your hands are late, you will feel the handle shifting inside your hands a pressing upwards on your left palm. Your hands must move so they follow the weight of the club. By doing this, the club begins dropping at a constant speed, the acceleration due to gravity. If your hands get the right feeling every time, your rhythm will be the same every time. Gravity alone is not enough to build up the amount of clubhead speed you need to hit the ball a reasonable distance. You add to that speed with your body turn. At no time, though, can you turn your body so fast that your are leaving the club behind. There is a third factor in acceleration, leading with your left side. Your left hand should get back to the ball before the clubhead does. Actually, this does not accelerate the swing. It prevents the swing from being decelerated as would be the case if the right side were to push the club through the ball. That actually slows down the swing. So this is what you practice — letting the club float downwards from the transition so the neutral feeling in your hands does not change, adding on your body turn without it getting out of harmony with the feeling the hands, and leading the club through the ball with the left side. The half wedge swing from the previous post is the drill to use to learn all of this. If you master this kind of downswing, the improvement in your ball-striking will be amazing. In my previous post, I said that the golf swing is best described as a continuous straight line motion, and I described the straight line concept. This post explains what I mean by continuous. If you could start out swinging the club toward the target, loop it around in a full circle, then hit the ball, the swing would be literally continuous. But it’s not. You swing the club back in one direction, stop, and swing the club through the ball in the opposite direction. Since you’re changing directions, you have to stop moving in one direction before you start moving in another. In that literal sense, in the physical world, the swing is not continuous. It starts, stops, and starts again. Your mind, however, is not limited by physical reality. If you consider the swing to be a continuous motion, it is. If you interpret your movement back and movement through as an unbroken movement, it is. I say, you should interpret your swing that way. The importance of doing that comes when you make the transition between the backswing and the downswing. That transition has to be as smooth and connected as possible. The start of the downswing has to be at the same speed and with the same feeling of movement as at the end of the backswing. For example, this is exactly how you pound a nail into a board. You take the hammer away, let it ease to a stop, and start back toward the nail the same easy way. You strike the nail in what feels like one stroke, not two. Similarly, the golf swing accelerates steadily beginning with the takeaway. Smooth acceleration is not interrupted by the transition. Practice this feeling by making a half wedge swing. Take the club back to where your left arm is parallel to the ground. At that point, let the club float in the air as it comes to a stop. The next instant, when gravity pulls the club down, just follow with your hands, so gravity pulling the club downward and your turn pulling it through accelerate it in tandem. In the end, it should feel like this was one movement, not two. When your transition connects the backswing to the downswing, you will hit the ball much better. In my next post, I will show you how to fine tune the transition to give yourself perfect rhythm and smooth acceleration into the ball.